It’s getting customers to write online testimonials and reviews of you so that potential customers read them and see they can trust doing business with you. It’s now one of the top five criteria Google uses to rank your website. The more testimonials and reviews you have—and the more recent they are—shows Google that your business is popular. As a result, Google will list your site higher in its search results when people search for your business. As well, more people now research a business’ online reputation before deciding who to buy from. The more positive recent customer testimonials and reviews you have, the more likely they will choose you over others who don’t have as many testimonials and third party reviews, especially recent ones. A 2014 survey found that 88% of consumers read reviews to determine quality of local businesses (opens in a new window). The problem is it’s hard to get customers to leave you online testimonials and reviews in practice. They promise to leave you testimonials and reviews, but then forget to or never get around to it. We offer a software solution that significantly increases your customer feedback/response rate. The software is on a name brand tablet and you get this tablet for free. How it works: customers rate you and give you testimonials on the tablet at time of sale when they’re most willing to give you a testimonial, not later. This maximizes your number of customer testimonials. Positive testimonials appear automatically on your website for potential customers to see. Negative ones do not, so you can fix them with the customer. The following video shows how the software works. Note you do NOT have to setup the software and email your customers as the video suggests. We now give you a free tablet with the software set up on it so you can use the software right away without having to email customers. Try 5 Star for 32 days from sign up for free and get more customer testimonials, online reviews, search engine love and business! We’ll set up the software for your business for free ($100+ value) and send you a credit for your free tablet. 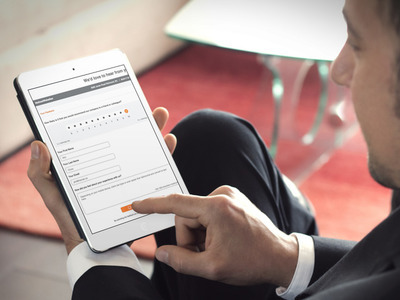 You can start to use the tablet right away to collect your customers’ testimonials and reviews. Note: you must have access to WIFI for the tablet to work. Most Internet providers offer this for free. Please check with your provider to set this up beforehand. After 32 days, pay only $60 $45 Canadian per month (Before the trial ends, a reminder email is sent to you asking if you would like to continue). The tablet is yours to keep for trying 5 Star out. **Note: Pay in US dollars and get approximately 20% off the quoted price depending on the current rate of exchange! Your satisfaction is guaranteed. On request, you can cancel your 5 Star plan at any time and not pay any further at the beginning of the next calendar month. The tablet is yours to keep even if you cancel. Just enter your business name, address and email address and click “subscribe”. We are PayPal verified and Comodo Secure (opens in a new window) for your assurance. Try FREE for 32 days. After, pay $45 monthly. Tablet is yours. Once your signup is processed and your software is setup for your business, we will email you a temporary password. Login with the password (don’t forget to change it to your own password) at the Manage Review page.